I can not believe that my little Lola is going to be four tomorrow! We'll be celebrating her birthday this coming weekend with an ice cream party. Lola chose the theme for this year's party quite some time ago. In fact, I believe it may have been right after her last birthday party finished! Lola has been super excited about having an ice cream party, and I've got to say that it's a pretty fun theme to get creative with. I've got all sorts of ice cream and popsicle themed activities and accessories lined up for the party and I can't wait to share them all with you. An ice cream party needs tasty invitations, right? 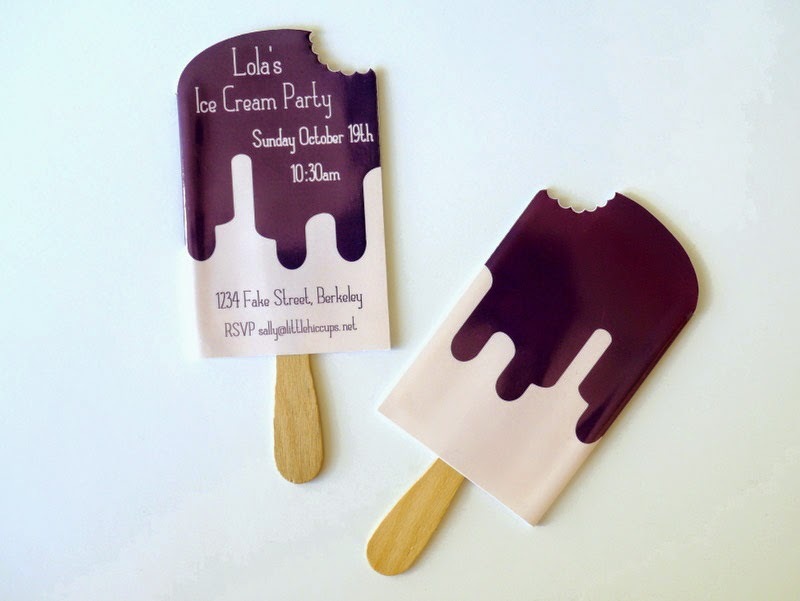 These little chocolate covered popsicle invitations do the trick. I made them three dimensional complete with popsicle sticks, a bite taken out the top and a wrapper. Don't they look delicious? I'm really happy with how these invitations turned out. Lola loves them too. She walks around the apartment pretending to eat one of them! This is so cute and sweet! I make paper goods and invitations and this may have to be my new summer inspiration, perfect for a child's birthday party or ice cream social!